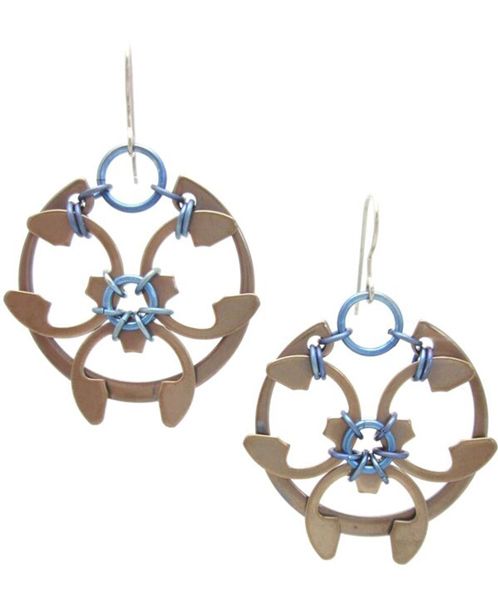 Elegant industrial shimmers of bronzes and blues, the Rose Window Earrings take you from the Iris van Herpen fashion exhibition to Stravinsky's Firebird (and then back to the office where you can dream about both.) Brown leather jacket, cerulean gown, polished grey suit -- whatever setting you choose, they work. Stainless steel hardware linked with titanium; so lightweight you'll forget you're wearing them -- until the next compliment. Hypoallergenic titanium ear wires; 2 inches long. Heat patina finish in bronzey blues and purples; each pair is similar, but unique.